Heat like this can take your breath away. An unusual number of people this summer are making appointments with doctors for runny noses, irritated eyes and sore throats. Some think allergies are to blame -- but it's actually the summer heat and high ozone levels. "Most allergists take vacation in August," said Jay Portnoy, chief of the allergy, asthma and immunology section at Children's Mercy Hospital. "But we're still seeing people with symptoms." Allergy season has been over for weeks, and pollen counts are very low now, Portnoy said. But a combination of heat, dryness and air pollutants such as ozone in Kansas City's air has picked up some of the slack. Besides allergy symptoms, heat and ozone can cause serious complications of asthma and other chronic diseases. So far this summer, the metro area is on track to record more elevated ozone levels than Kansas City has seen since the early part of the last decade. The area has seen 13 days of ozone levels above 75 parts per billion, compared to six days at this time last year, which itself had higher ozone than usual. In all, 2011 ended with 14 ozone alert days. On some days, ozone levels have reached close to 96 parts per billion over an eight-hour period, which require a more serious red alert, warning that conditions are unhealthy for anyone. 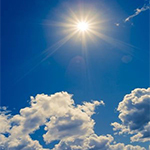 The Mid-America Regional Council issues ozone alerts when air conditions are unhealthy for active children and adults, especially those with respiratory diseases such as asthma, to exert themselves outdoors. Symptoms such as irritated eyes, nose and throat can mimic allergies. "A lot of people don't think of air quality as being a trigger for that sort of thing," said Amanda Graor, air quality program manager for MARC. "Allergies might be the first thing they think of. But that's why the health standards exist." In the long view, Graor said, Kansas City's air has gotten better. Between 2002 and 2005, it was not uncommon for ozone in Kansas City to exceed today's limits more than 30 days each year. The likely causes of our elevated ozone this year are heat and drought. Without a rainstorm to clear the air, ozone remains concentrated over the metro area for longer. That ozone can reach as far as Tonganoxie, Kan., where Sarah Ryun, 68, has had to give up going outside during the day as her breathing problems worsened. "It's been bad," she said. "I was doing good, until this summer." Ryun has lived with a chronic lung disease for more than six years, but still managed to care for a garden of roses, lilies and petunias. Now the heat has made her give that up. "It makes me deathly sick and dizzy," she said. "It absolutely takes my strength." She only dares to go outside around 4:30 a.m. When the sun comes up, she must go inside. No more does she sit out on the porch and go walking with friends. Her doctor, Heath Latham, a pulmonary disease physician at the University of Kansas Hospital, has advised her to remain inside, in the air conditioning. This summer, Latham has had more patients calling in with breathing difficulties and allergy-like symptoms. Some know the heat is behind it, he said, and others don't. Some patients experience only mild symptoms, he said, and only need to avoid the heat or use their inhalers more often. But others have had to be hospitalized in intensive-care units. It's been worse than in summers past, he said. He said he also saw more exacerbated symptoms in the spring. Portnoy, at Children's Mercy, saw more patients in allergy season, too. But then it really was allergies. Pollen levels in Kansas City hit an all-time high of 8,000 particles per cubic meter. A massive explosion of pollen, Portnoy said, fell over the metro area after the unseasonably warm winter threw trees' pollination schedules out of whack. Several varieties of trees pollinated at the same time. Since then, the summer heat has stopped all that pollination, aside from the surviving grass. Portnoy said he expects the summer heat and drought could also delay ragweed allergy season, which usually falls in mid-August. But when it comes, it might be all at once -- another massive explosion. "It might be a record year for ragweed," he said. For those who aren't suffering from allergies, but rather the heat and smoggy air, doctors recommend staying indoors when possible, and avoiding the hottest parts of the day. Graor said everyone can help cut down on ozone levels by driving less as well as avoiding fueling cars and running lawnmowers on ozone alert days. To reach Ian Cummings, call 816-234-4449 or send email to icummings@kcstar.com.